The Pirate Empire: What did a REAL pirate sound like? By this time, most of the folks reading this blog know that all of this started as a result of one man, actor Robert Newton, who played the part of long John Silver in Disney’s first live-action movie, Treasure Island, in 1950. Newton set the standard for pirate talk forever after. But did you know that all he did was to emphasis his own broad West Country accent? The West Country of England was known for its smugglers and pirates, and so there’s a solid bite of truth in Newton’s original vocal interpretation. And I wish more folks of African ancestry wanted to play as pirates! Another accent found in the real pirating world was the Irish. Many Irish, as well as Africans, were shipped to the Caribbean as slaves, and the “Caribbean accent” of today is heavily influenced by the lilt of Ireland. So an Irish accent is perfect for a pirate! And just in case you doubt the Irish in real pirate speak… Check out this video of some really interesting Irish speakers on the Emerald Isle of Montserrat in the Caribbean. 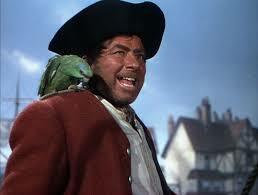 Of course, some of the most famous pirates, including Olivier Levasseur– The Buzzard – were French. So, if you’re partial to French, you might try out a French accent for your pirate persona. Levasseur was from a so-called good family. So you don’t even have to make an effort to sound “rough.” Being a French pirate would also be a great excuse to swill wine and wear some nice pirate clothes. Dutch pirates have been used for comedic effect in shows such as Black Sails (coming again this January for its last season on Starz.) But many, many Dutch were pirates. One of the most interesting was Hendrick Quintor, a Black man of Dutch nationality who sailed with Sam Bellamy on the Whydah Galley. I think a Dutch accent on a Black pirate would be sure to be engaging, encouraging members of the public to ask questions and learn about historic pirates. Or, if you enjoy playing Bad guy pirates, you might want to channel the ghost of Roche Braziliano, whose family emigrated from the Netherlands to Brazil, and who sailed with the notorious Captain Morgan. Either of these men, or any of a hundred others, would have had an accent like this. The point is that ANY accent can be a pirate accent! Pirates came from nearly every nation, so Italian, Spanish, Portuguese, Greek, and even Chinese and Japanese can be pirate accent. Scholars think that the least evolved English in the Americas is the language of the Appalachian Mountains. English-speakers migrated here, and then their language didn’t change. Instead, “English” migrated away, making changes that define a so-called English accent today. So if you want to stir things up, try the “pirate accent” here. Yup, the "pirate accent" aka West Country is what everyone hears, andwhy I think Phil Harding of Time Team fame was born to be a pirate. Ooh arr!